Pope Julius II, who was pope from 1503-1513, commissioned a series of highly influential art and architecture projects in Rome. 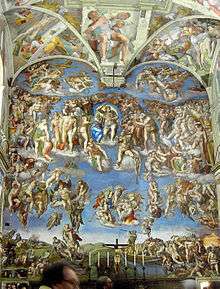 The painting of the ceiling of the Sistine Chapel by Michelangelo and various stanze in the Vatican by Raphael are considered among the masterworks that mark the High Renaissance in Rome. His decision to rebuild St Peters led to the construction of the massive basilica we see now. The term High Renaissance was first used by Giorgio Vasari, a pupil of Michelangelo. Artists such as Michelangelo, Raphael and Bramante were at the height of their careers during this time. While Julius II is also remembered as the “Warrior Pope” for his Machiavellian tactics, he was also given the name of "the Renaissance Pope." He modeled his patronage practices on those of his uncle Pope Sixtus IV (1471–84), and began amassing large personal and public art collections and commissioning numerous civic and religious buildings when he served as a cardinal and Cardinal Archbishop under Pope Nicholas V and Pope Innocent VIII respectively. His additions to the art collection of the Vatican may be Julius II's most impressive venture. He commissioned such projects as the painting of the Sistine Chapel’s ceiling, the reconstruction of St. Peter’s Basilica, and the frescoes of the Stanza della Segnatura and Stanza d'Eliodoro, known as the Raphael Rooms, including the School of Athens. His reasons for commissioning these, as well as other art works were varied. They served political, spiritual and aesthetic purposes. Also, during his papacy, the lead up to the Protestant Reformation produced increased tension in Christianity, which caused the Catholic Church to lose influence and political power in Europe. Several of his predecessors were poor, unjust, and impious rulers who caused people to doubt the papal seat and the Vatican’s monopoly on religion. For these reasons, among others, Julius requested the magnificent and powerful images that are still so recognizable today. When Julius died, several of his commissions were still underway or unfinished at the time of his death. During his reign, Julius II utilized his iconic status to his advantage, displaying his interest in the arts by placing himself on medals, emblems, and by commissioning specific artworks containing his image. Choosing to commission objects such as medals or coins is quite different from, having a self-portrait created. A medal or coin can be representative of an “antitype” or “modern counterpart” to typical, readable typologies that commonly appear in art. The “types” can serve as a code to decode antiquity, Renaissance or even Baroque art. The most noticeable self-referencing image trend on the coins and works of art commissioned by Julius II was the “Della Rovere oak." In Italian "rovere" means oak, derived from the Latin "robur," meaning strength or oak tree. The Spernadino medal of Giuliano Della Rovere (1488) is a prime example of a representation of the “Della Rovere oak". In addition, the giant oak in the Belvedere Courtyard was commissioned by Julius in 1504 to be incorporated into Bramante's design for the three-tiered area. The Della Rovere coat of arms bore an oak tree and the family was referenced with the emblem of the acorn, which had mythological, Christian, and Republican Roman iconographic associations. In reality, however, Julius did not belong to the Della Rovere clan, which was established in Vinovo, near Turino. His uncle Sixtus IV was from a family of merchants and Julius II's own father was a fisherman. Sixtus IV had fabricated a lineage associated with the Della Rovere counts when he was a cardinal and saw an opportunity to ascend to the papal throne. In 1511, Julius commissioned two portraits of him by the master Raphael. One is in the Uffizi Gallery in Florence and the other in the National Gallery (London), the latter being the more famous of the two. 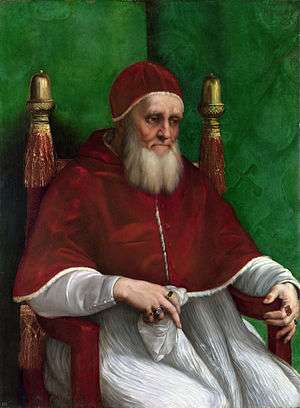 Several years after its completion, Vasari would comment how it was 'true and lifelike in every way', and the composition became influential, seen in later portraits such as Titian's 'Pope Paul III' of 1543. Julius' long beard was a sign that he had recently lost the state of Bologna, and helps to date the painting, as the beard is recorded as being shaved off in March 1512. 1506 – Michelangelo returns to Rome due to a lack of funds available for the project. Bramante and Raphael, apparently jealous of Michelangelo's commission, convince the Pope that it would be bad luck to have his tomb built during his own lifetime, and is dismissed by Julius. Michelangelo, angry and bitter, returns to Florence. Julius, now with his army in a siege against Bologna threatens to wage war on the state unless Michelangelo presents himself and apologies, which he does. Julius give Michelangelo the unwelcome task of creative a huge bronze sculpture of the Pope. This takes two years of incredibly hard work. He then returns to Rome, hoping the Pope will renew his interest in the Tomb project. 1508 – Bramante and Raphael convince the Pope that Michelangelo's time would be better spent on the Sistine Chapel ceiling in the Vatican Palace (assuming that Michelangelo, primarily a sculptor, would have great difficulty in completing a painting of such scale). 1512 – Michelangelo completes the Sistine Chapel ceiling project and returns to the tomb. 1513 – Michelangelo begins three sculptures for the project: the 'Dying Slave' and the 'Rebellious Slave' (now in the Louvre, Paris) and 'Moses', which is now a part of the final design. When Julius dies the new Pope Leo X abandons the project. 1516 – A new contract is agreed between Michelangelo and Julius' heirs who demand the completion of the project. 1532 – A second new contract is signed by Michelangelo which involves a wall-tomb. 1542 – The wall-tomb is begun by Michelangelo after final details are negotiated with Julius' grandson. 1545 – The final tomb is completed, and installed in San Pietro in Vincoli in Rome; it includes the original 'Moses' sculpture along with 'Leah' and 'Rachel' on the lower level, and several other sculptures (definitively not by Michelangelo) on the upper level. One of Pope Julius II’s largest and most well known commissions was the reconstruction of St. Peter’s Basilica, beginning in 1506. When Julius took the papal office, the condition of the Church was extremely poor, and he took the opportunity to expand it, modernize it, and leave his impression forever on the Vatican. Julius hired Donato Bramante to design the Basilica, a prominent architect and artist of the day. This was seen as a surprise move at the time, many thought Giuliano da Sangallo was the front runner for the commission. Della Rovere wanted the splendor of the new basilica to inspire awe in the masses, produce support for Catholicism and prove to his enemies he was a pious and devoted man. Bramante not only would fulfill these expectations with his design, but also with his character, which may explain why della Rovere chose him over Sangallo. “Bramante wanted to build a Basilica that would ‘surpass in beauty, invention, art and design, as well as in grandeur, richness and adornment all the buildings that had been erected in that city’" (Scotti, 47). Raphael came to work for the Pope because of his friendship with Bramante. Bramante had been in Rome working for the Pope when he sent a letter to Raphael telling him that he had convinced Julius to allow Raphael to paint the Stanza della Segnatura. Raphael who had been working on other commissions in Florence immediately dropped his projects and moved to Rome to work for the Pope, but when he arrived he found many great artists painting in the Stanza della Segnatura. When he finished the Vatican Library, he amazed Julius II so much that according to Vasari he chose "to destroy all the scenes painted by other masters from the past and present, so that Raphael alone would be honored above all those who labored on the paints which had been done up to that time"(Vasari, 314). "Cappella Sistina." Lubilaeum. 8 Dec. 1994. 5 Feb. 2007 <http://www.christusrex.org/www1/sistine/0-Tour.html>. De Tolnay, Charles. Michelangelo, Vol. IV: The Tomb of Julius II. Princeton: Princeton University P, 1945. Felix, Gilbert. The Pope, His Banker, and Venice. President and Fellows of Harvard College, 1980. Frank, Isabelle (1996). "Cardinal Giuliano della Rovere and Melozzo da Forli at SS. Apostoli". Zeitschrift für Kunstgeschichte. Deutscher Kunstverlag GmbH. 59 (1): 97–122. doi:10.2307/1482788. ISSN 0044-2992. JSTOR 1482788 – via JSTOR. (registration required (help)). Goldwaite, Richard A. Wealth and the Demand for Art in Italy, 1300–1600. Baltimore: The Johns Hopkins University P, 1993. Gosman, Martin, ed. "The Patronage of Pope Julius II." Princes and Princely Culture 1450–1650. Danvers, MA: Koniklijke Brill NV, 2005. 43–61. Hall, Marcia, ed. Raphael's School of Athens. Cambridge: Cambridge University P, 1997. Hersey, George L. High Renaissance Art in St. Peter's and the Vatican. Chicago: The University of Chicago P.
Hoover, Sharon R. "Pope Julius II." Tour of Italy. May 1999. 5 Feb. 2007 <http://touritaly.org/magazine/people01/jul01.htm>. Jokinen, Anniina. "Julius II." Luminarium. 15 Mar. 2003. 5 Feb. 2007 <http://www.luminarium.org/encyclopedia/julius2.htm>. King, Ross. Michelangelo and the Pope's Ceiling. London: Chatto and Windus, 2002. Minnich, Nelson H. "Julius II (1503–13)." The Great Popes Through History. Ed. Frank J. Coppa. 1 vols. Westport: Greenwood P, 2002. Partridge, Loren, and Randolph Starn. A Renaissance Likeness. London: University of California P, 1980. Pastor, Ludwig. The History of the Popes, from the close of the Middle Ages, Vol. VI, 2nd ed. St. Louis: Kegan Paul, Trench, Trubner, and Co., Ltd., 1902. "Pope Julius II." Who 2? 5 Feb. 2007 <http://www.who2.com/juliusii.html>. Reynolds, Christopher. Papa; Patronage and the Music of St. Peter's, 1380–1513. Berkeley: University of California P, 1995. Scotti, R.a. Basilica the Splendor and the Scandal: Building St. Peter's. New York, NY: Penguin Group, 2006. Shaw, Christine. "The Patronage of Pope Julius II." Princes and Princely Culture 1450–1650 2 (2005): 43–61. Shaw, Christine. Julius II: The Warrior Pope. Cambridge MA: Blackwell Publishers, 1993. Vasari, Giorgio. The Lives of the Artists. Trans. Julia C. Bondanella and Peter Bondanella. Oxford: Oxford UP, 1991. Verstegen, Ian, ed. Patronage and Dynasty: The Rise of the Della Rovere in Renaissance Italy. Missouri: Truman State University P, 2007. Weiss, Roberto (1965). "The Medals of Pope Julius II (1503-1513)". Journal of the Warburg and Courtauld Institutes. Warburg Institute. 28: 163–82. doi:10.2307/750668. ISSN 0075-4390. JSTOR 750668 – via JSTOR. (registration required (help)). Zucker, Mark J. (1977). "Raphael and the Beard of Pope Julius II". The Art Bulletin. College Art Association. 59 (4): 524–33. doi:10.2307/3049707. ISSN 0004-3079. JSTOR 3049707 – via JSTOR. (registration required (help)).